Moyenne Island is a small island (0.099 km2 or 0.038 sq mi) in the Sainte Anne Marine National Park, 4.5 kilometres (2.8 mi) off the north east coast of Mahé, Seychelles. Since the 1970s it has been a flora and fauna reserve. 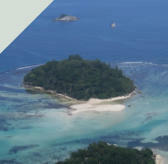 The island is now a National Park and can be visited as part of organized trips. From 1915 until the 1970s, the island was abandoned until its purchase by Brendon Grimshaw, a former newspaper editor, originally from Dewsbury in Yorkshire, England. Brendon purchased the island for £8,000 in 1962 and set about making it habitable. He was the only inhabitant of the island until his death in July 2012. He was only the third occupant of the island. With the help of Rene Antoine Lafortune, they operated the island as a nature reserve, charging visitors €12 to come ashore, roam the island, dine at the "Jolly Roger" restaurant and relax on the beach. Brendon and Rene planted sixteen thousand trees, built 4.8 kilometres (3.0 mi) of nature paths, and brought and bred giant tortoises, creating an island of incredible beauty now worth 34 million Euros (as of 2016). 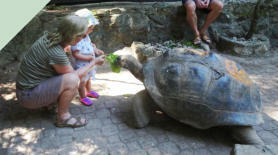 Apart from a wide variety of plant and bird life, the island is home to around 120 giant tortoises. The eldest, Desmond, was 76 years old, according to Brendon in 2012. 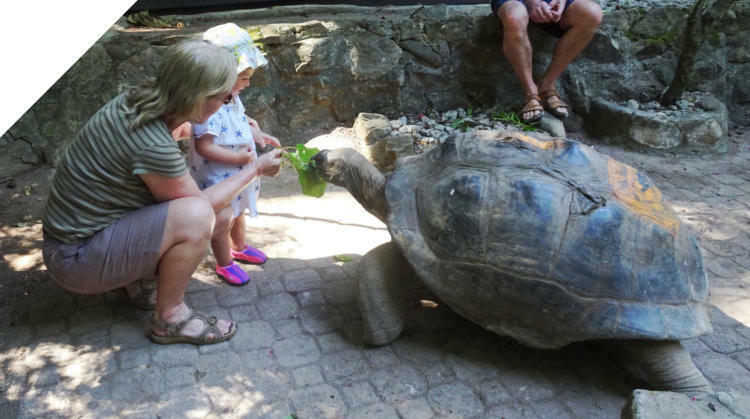 He named the tortoise after his godson. After 20 years of persistence, Brendon and his assistant, Rene, achieved their goal of making Moyenne Island a National Park in its own right, separate to that of the Sainte. Anne marine park. Now known as the Moyenne Island National Park, it harbours more species per square foot than any other part of the world. 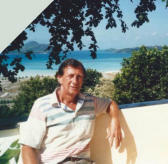 Brendon died in Victoria, Mahe, in July 2012. In 2013, after the island had received its own national park status, a new hut was built and a warden was posted on the island, collecting the entrance fee from tourists. The Aldabra giant tortoise, from the islands of the Aldabra Atoll in the Seychelles, is one of the largest tortoises in the world and is also one of the world's longest living animals, with one individual reaching the grand old age of 255 years old. The carapace of the Aldabra giant tortoise averages 122 cm in length with an average weight of 250 kg. Females are generally smaller than males, with average specimens measuring 91 cm in length and weighing 159 kg. It’s neck is very long, even for its great size, which helps the animal to exploit tree branches up to a meter from the ground as a food source. There are rumours that pirate treasure is buried on the island. Brendon made two major digs and found some evidence of man- made hiding places, but no gold or other treasure has been found as of yet. There are two graves on the island which have been said to be those of pirates, although this cannot be confirmed. Another grave is Brendon’s father - he stayed there from the age of 87 to 92 after the death of his wife. 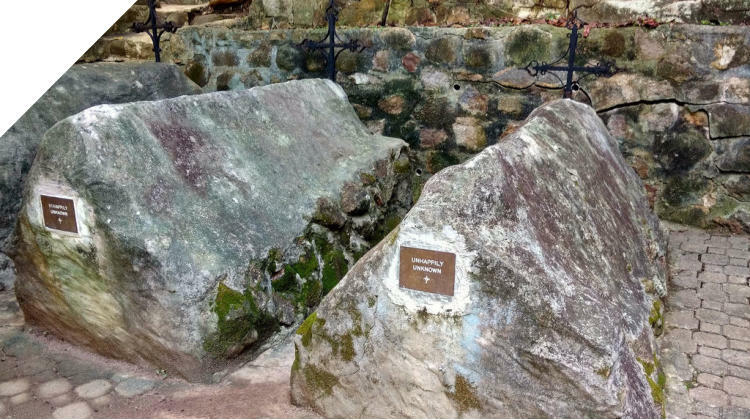 The fourth grave is that of Brendon Grimshaw.